What is the maximum weight? What is the spacing between the support points? Is the load's center of gravity between outer pick points? If no, please specify the location in reference to the pick points. What is the maximum time the lifter is in contact with the load? What is the minimum cool down time between lifts? What is the lifter service class required based on desired fatigue life? Service class 3 = 500,001 - 2,000,000. Service class 4 = over 2,000,000. Are there any additional application details or options required? Lifting beams are available in a wide range of capacities and configurations. Lifting beams are designed per application. Multiple spreads for hook placement. Wide range of sizes and capcities. These Vacuum Lifting Beams are designed to handle large sheets or plates of metal in the primary metal industry as well as various other industries. Designed to your material weight and size requirements. 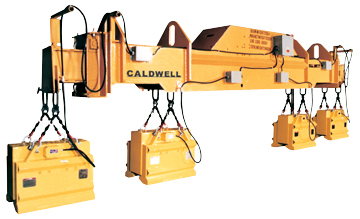 Units can be operated with a pendant, crane mounted controls, or radio controls. Lifting beams are custom designed per application. Powered rotation for horizontal location. Durable LED lights and gauges. Low vacuum indicator warning system. High temperature environment capability up to 600 degrees Fahrenheit. Trolley mounted crossarms for ease of adjustment. Vacuum pads and crossarms adjustable to handle a wide range of material sizes. Handles ferrous and non-ferrous material. Vacuum reserve system to hold load during temporary power failure. Design assures quick attachment and release. This telescoping, rack and pinion style beam allows for handling of a wide variation of product lengths. Lifting beams are custom designed per application. Individual 90 degree rotation of magnets for wide loads. Non-telescopic units are also available. Heavy duty rack and pinion telescoping drive. Telescopes to handle varying lengths. Designed to accommodate your lifting magnets.